The Bird Nest Cabin is located in close proximity to Natural Bridge State Park. 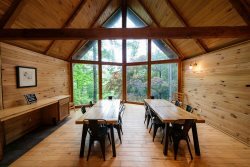 The cabin offers an uncomplicated get-away for those looking to enjoy nature's beauty near the Natural Bridge State Park. It is the perfect choice for those wishing to get a break, while not spending a lot. Located near a cliff line, it takes a five minute hike to get to the cabin. The path has an 80 foot elevation change, so take it easy :). Once you get there, you’re away from it all! There are two stories: the first story contains the kitchenette, dining area, and private deck with picnic table, bathroom with shower. The second story contains the sleeping loft. It can comfortably sleep two. The cabin is located near Natural Bridge State Park. The cabin is approximately one half mile from the trails and recreational area in Natural Bridge State Park and from Hoe Down Island and the swimming pool. -Double Bed, Freezer, Fridge, Towels, Air-Con, Coffee Maker, Linens, Balcony, Utensils, Parking, Toilet Paper, BBQ, Deck, TV for DVD only, Deck/Balcony, Gas Grill, Patio Furniture. -Towels and linens provided. Kitchen includes microwave, two burner hot plate, cups, mugs, silverware, plates, pots and pans.There is a propane grill on the porch. * Rates are subject to change without notice. Pricing excludes taxes, additional options or fees. -To access Bird Nest, guests park in the parking lot of Quiet Waters Cabin Complex (4 cabins). Bird Nest is a short hike up the hill, behind the cabin complex. -There is a small family cemetery in the grassy area next to the parking lot at Quiet Waters Cabin Complex.